The Terraced Garden archeological site was first recorded by the United States Forest Service in 1979. It is believed to be associated with Chinese occupation in Sanders County during and after the construction of the Northern Pacific Railroad in 1883. However, archaeological and historical investigations have shown that this site reflects a non-Chinese mining event dating to the 1905-1930 period. This site is another example of the Chinese-ification of unique archaeological sites with immaculate stone-work. 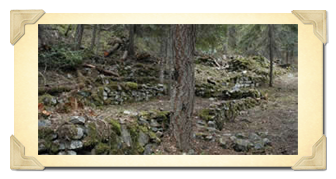 The Terraced Garden archeological site was first recorded by the United States Forest Service in 1979. It is believed to be associated with Chinese occupation in Sanders County during and after the construction of the Northern Pacific Railroad in 1883. The site consists of a series of hand laid dry masonry terraces that may represent living areas and terraced gardens. Similar Chinese occupation sites have been recorded and reported on along the Salmon River near Warren Idaho. 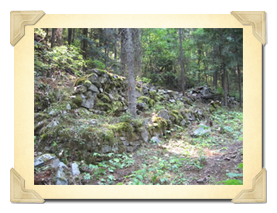 The Terraced Garden site also includes the remains of a collapsed cabin and placer mining deposits, as well as a mine adit. Local folklore describes the site as a refuge for Chinese railroad workers from the Northern Pacific railroad who were brutalized and ran away from their construction jobs. They subsisted by re-working abandoned placer claims and subsistence farming in the tight narrow canyon. To date, no historical sources have been found to verify the local popular accounts. In addition, the site’s popularity among residents of the Plains area has fostered a local appreciation for a research endeavor aimed at unearthing some this site’s mysteries. The research agenda for the Terraced Garden Site will integrate Master’s and Ph.D.-level projects with the need to document and understand a rare example of archaeological ruins in western Montana. These impeccably-constructed, dry laid stone terraces are a rare find and are a rich source of information about a group of people who left such a unique mark on the land. 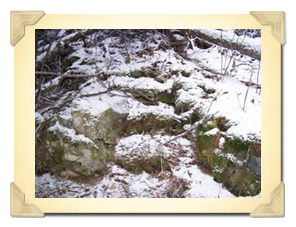 Although they may have been able to make a living by reworking abandoned placer mining claims and perhaps by subsistence farming on the terraces, project will locate historical documents and examine the site's archaeological remains to verify the popular, local accounts. In doing so, this project will discover the original function of the site; confirm the ethnic background of its occupants and explore their economic position(s). The process of addressing these research questions began in the spring of 2006, with Jen Childress’ historical record search and preparation of a National Register of Historic Places nomination for the site. Additional work included the week-long advanced field school of U of M students, and Passport In Time volunteers during the fall of 2006. Archaeological testing of the terrace features discovered a small amount of artifacts, none of which were clearly Chinese in origin. These artifacts do help the researchers pin down some of the occupation dates associated with the terraces, as most of the recovered materials date to between 1880 and 1930. During this time, additional work focused on completion of the site map, investigation of the surrounding terrain for additional features, and collection of soil samples for pollen analysis. Preliminary pollen results suggest that the soil on the terraces were infused with agricultural lime, potentially substantiating the idea that the masonry features related to an agricultural use. Additional pollen data is still pending. During the summer of 2007, Ph.D. student Chris Merritt, under the supervision of Dr. Kelly Dixon will lead a small research team, supplemented with PIT volunteers, to conduct extensive archaeological excavation and survey of the Terraced Garden features. This project will encompass three weeks in May and June 2007. Crews will also survey the entire surrounding drainage looking for additional archaeological materials related to the terrace occupation. By investigating more of the site’s features, and intensifying excavation efforts, the researchers will recover data to address the above research questions. Terraces have been reclaimed by nature since their abandonment.